Why Are There so Many Service Animals? 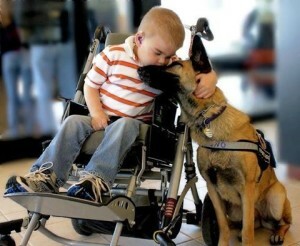 Have you noticed there seems to be a lot more service dogs lately? Service animals, emotional support dogs, companion animals…Why are there so many more service animals than there used to be? 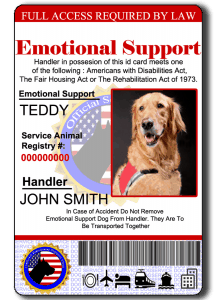 Emotional Support Animal (ESA; not to be confused with service animals) certifications are up 279% since 2011, and news reports about ESAs are up five times during the same period. It is highly unlikely that the incidence of mental health problems has grown this much in four years. A more likely explanation is that pet lovers have found a loophole in the law to force property owners with a “no pets” policy to accommodate them. Unfortunately, there is little a property owner can do without risking expensive legal action from violating the Federal Fair Housing Act. Unlike service animals that are defined as “a dog who has been trained to work or perform tasks for the benefit of an individual with a disability…” and certified by state regulatory agencies, an emotional support animal requires no special training. In fact, an ESA can be virtually any type of animal that serves as a companion for those suffering from the effects of mental disorders or who experience anxiety or emotional instability. How do you know if an animal is truly needed for emotional support? If the disability is not obvious or apparent, you cannot ask about the disability. However, you may ask “Do you have a documented medical need for an emotional support animal and can you provide it in writing. If the answer is no, you may object to the request. A “yes” is problematic. You cannot inquire about the nature of the disability, but you can require documentation from a health professional. 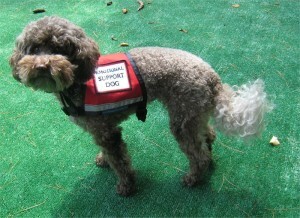 There are many online sources for “Registered Emotional Support Animal” certification that cost as little as $59.00. These certificates do not meet the documentation standard mentioned above. Your Real Property Management office knows the difference between these bogus forms and real documentation from a health professional. Expect more tenants to claim a need for an emotional support animal. By law, you are required to make reasonable accommodations to them, and you cannot charge tenants extra for having an emotional support animal. A professional #propertymanager will know the difference between real and fake documentation. Take heart that there really are people who need an emotional support animal, and hope that when you encounter a request, it is legitimate.